In this version, though, I’ve opted for ease after cooking rather than during cooking. Here in this little nest that I’ve built with my midwestern fella, I’ve grown to like the idea of having the veggies already chopped and the chicken already shredded. 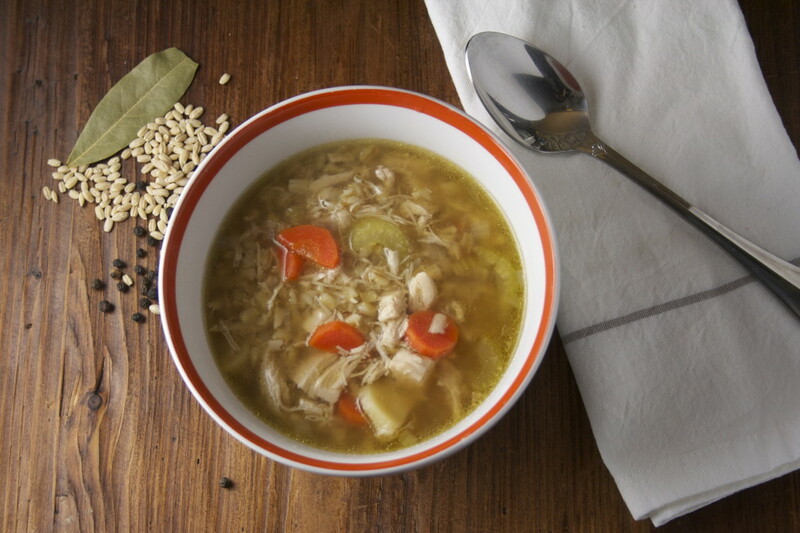 I’ve boosted the flavor of the broth — which, when I make my mom’s version, is often weak because I use comparatively less chicken — by sauteeing some chopped onion and browning the chicken first, then layering flavors with a couple of unpeeled carrots and parsnip, a celery stalk, all cut into thirds, and a bay leaf. Essentially I’ve made a quick stock first, removed the vegetables, which have given all their flavor and their being to the broth, and then added fresh ones, already chopped or sliced and ready to be just barely softened. And in this iteration of home I’ve replaced the usual noodles with barley, cooked right in the broth, giving the soup a nutty sweetness and thickening the broth ever so slightly as their starches are released during cooking. It matches the sweet onion, carrot, and parsnip absolutely perfectly. Perfect for the dead of winter, a blustery night, a runny nose, tired legs, an aching heart. Chicken soup plants me into the soil of the Bronx and the Lower East Side, and I can feel, at the very tip of my roots, what it was like to walk through the bustling streets of Bucharest, spread out a blanket and eat and laugh by the river in a little town in Poland called Bedzin, and travel, before the cusp of disaster, thousands of miles across an ocean in the belly of a ship to an unfamiliar landscape and an unknown future. 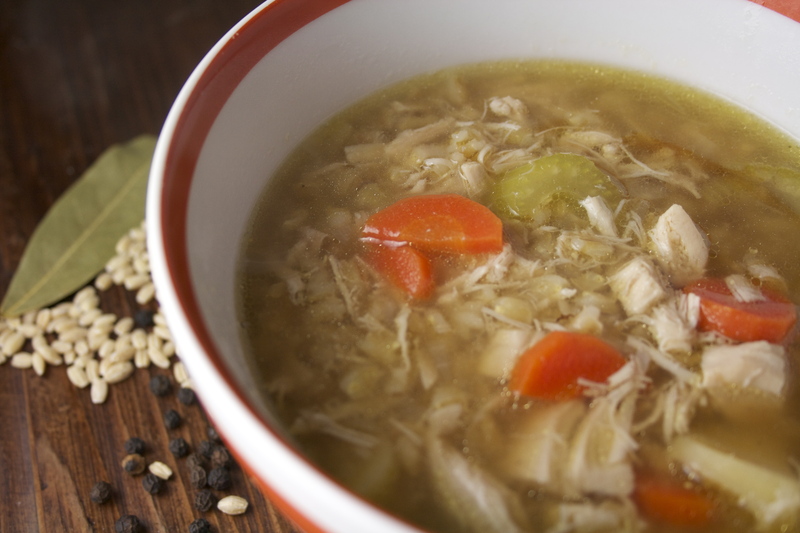 Chicken soup, though, is never unfamiliar, is never unknown. 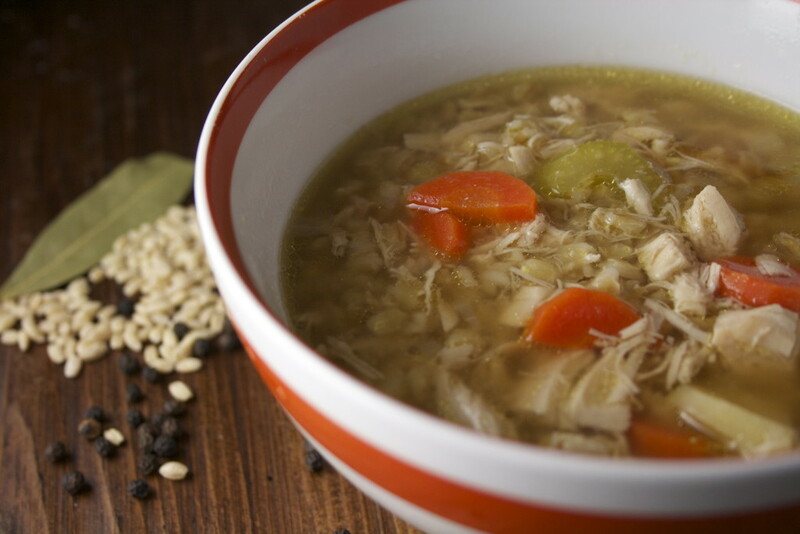 No matter whether it’s filled with noodles or matzoh balls or rice or barley, scented with bay leaf and thyme or simply salt and pepper, chicken soup thickens our blood, sturdies our bones. It’s who we are. Like so many chicken soups, this is, of course, ultimately adaptable to your preference. We love parsnips for their elevated earthy sweetness, even moreso than carrots, so we’re pretty heavy on them — I will sometimes use three parsnips in the finished product. I definitely do recommend them for the stock as well, and a little goes a long way here. But really, I just try to come up with a combination of about 3 cups of chopped vegetables for the finished soup. Too much more and the chicken and barley are crowded out. And on that note: don’t be tempted to add more barley unless you’re using more stock. It plumps up quite a bit in the hour of cooking and soaks up a lot of the broth. You can use even less if you want a brothier soup, down to ½ cup. In a dutch oven or stock pot, heat oil over medium heat. Toss in onion and saute for 3-4 minutes. Make space by moving the onions and place chicken breasts skin side down, and cook for about 8-10 minutes, or until the skin begins to brown. 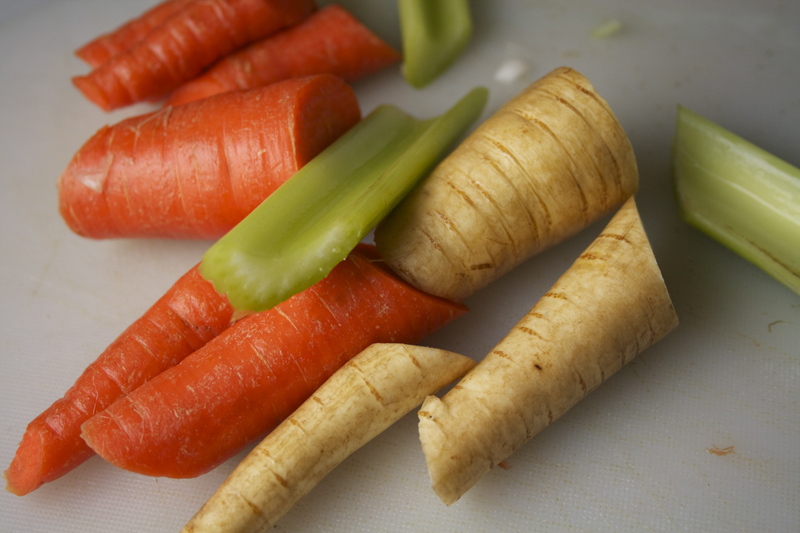 Toss in carrots, parsnip, celery, and bay leaf. Pour in water, season with the salt and a few grounds of pepper, and bring to a boil. Skim the muck that has accumulated. Cover, reduce heat, and simmer for 30 minutes. Remove chicken to cutting board and allow to cool before cutting or shredding. Discard skin and bones. Pour the stock through a strainer, catching all the vegetables and the bay leaf, and press with a spoon to release as much liquid as possible. Discard vegetables. Wipe out pot and pour stock back in. Return to heat. 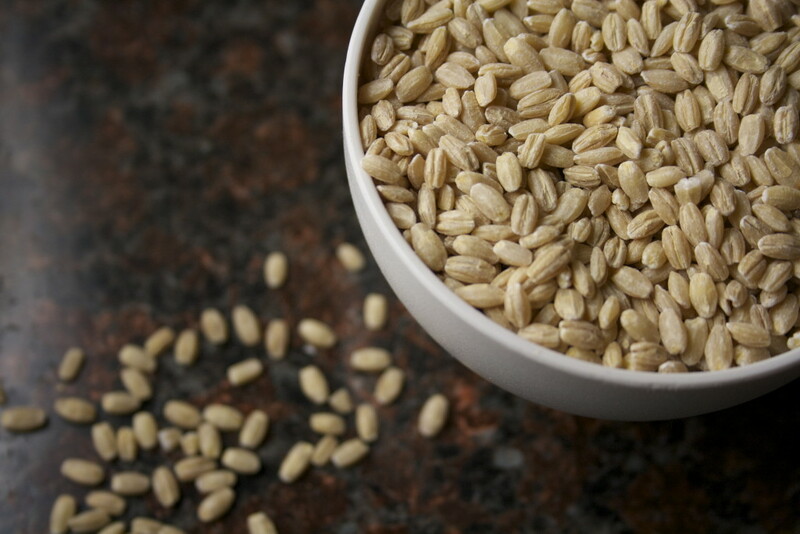 Add barley and bring to a boil. Add chicken, cover, lower heat, and simmer for 45 minutes. Add sliced carrots, parsnips, celery, and onion. Cover and cook for another 15 minutes, or until the barley and the vegetables are tender.